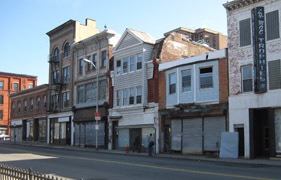 A row of six two- to four-story buildings dating from the end of the 19th century and contributing to the downtown historic district of Yonkers became vacant and derelict. 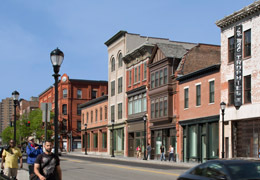 STA designed the renovation and historic restoration of these badly deteriorated buildings to return them to their original function as residential occupancy over retail stores. The design accurately restores the exteriors, qualifying them for historic tax credits, and completely renovates the interior spaces for six retail stores and ten energy efficient, transit-oriented apartment units.